Home > General > Is A Hair Transplant Right For You? Considering a FUE hair transplant? Beard transplant? Maybe you have been trying different solutions for years, or maybe you just began taking action. Balding or substantial hair loss can make you feel self-conscious or even depressed. Whether age, genetics, stress, or disease is the cause, you miss the hair you once had. You just want your hair back. About 50 percent of women are affected by hair loss, while about 80 percent of men will be affected by the age of 80. There are so many people affected, yet so many failed solutions on the market. From laser therapy and transplantation to PRP and other options, finding an effective treatment can be exhausting and overwhelming. Knowing what to do or who to contact is simply a daunting task. What Makes A Quality Hair Transplant Specialist? When facing problems with hair loss, you may feel defeated. Where do you turn? Is there a solution to this hair loss? Searching for a successful solution can be overwhelming. Supplement marketers will push and advertise anything to get your money, while honest results are put on the back burner. You need something that works, but knowing that hair loss and thinning can quickly progress to more severe and irreversible stages, prompt action is vital. Visiting a hair transplant specialist is your best place to start. You should always look for a specialist who is experienced and well adapted to the newest technologies of the industry. You want a specialist who truly understands your struggle and truly cares about your results. A substantial number of satisfied patients is always an important factor to look for in a hair transplant specialist as well. Because acting fast is so vital and your hair is an essential component to your appearance, finding a hair transplant specialist you can trust cannot be emphasised enough. Your hair is important. Look for a specialist of excellence, and never settle for less. This is a hospital procedure where hair follicles can be revived and regain health by removing a small portion of blood, filtering and separating it into desired chemistry, and returning it back into the body. Sometimes hair loss is due to hormone imbalances; mesotherapy involves applying a solution that is designed to balance out the DHT hormone, which will promote hair growth. 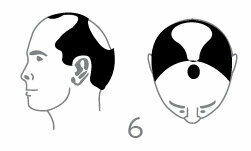 Which Stage Of Hair Loss Do You Fall Under? Using the Norwood Scale, we will break down the different options for you. You can “self-diagnose” yourself and evaluate the appropriate treatment for you and your needs. Of course, you can always get a more elaborate and customised treatment by scheduling a consultation as well. Take a look at the image below, and determine which image best represents your hair. 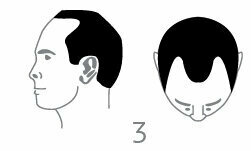 Type 1 hair loss typically exhibits a receding hairline. The hairline sits further back then it once did. This often accompanies ageing, and can quickly progress into Type 2 loss. As this is the earliest stage in hair loss, it is the best opportunity to halt its progression before it develops into a bigger problem. Usually, a hair transplant or intensive procedure is unnecessary but some people may choose to consult a hair transplant expert to start with procedures to treat the receding hairline issues they are experiencing. People with Type 2 hair loss often have notable thinning towards the front of the crown. Although the hair loss isn’t substantial yet, this stage is often underestimated. Because Type 1 has been surpassed, having Type 2 hair loss is a strong indication of progressing loss – some people never exceed Type 1 because it is often mistaken for a non-progressive form of hair loss. It is best to take action quickly to prevent any further loss. Considering that this is an earlier stage in hair loss, there is still significant potential in regaining all hair. Consulting a professional is imperative in determining if hair loss is progressive. At this stage, options for hair loss treatment are Mesotherapy, PRP (Platelet Rich Plasma)Treatment and Hair Growth Factor. Type 3 hair loss is best described as slightly moderate hair loss. 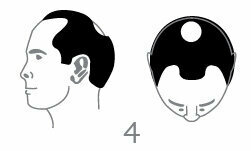 In this stage, the thinning hair is primarily towards the front of the crown while there may be signs of slight thinning towards the back as well. This stage sits on the brink of significant, unmanageable hair loss. Consulting a hair loss specialist is highly recommended at this stage to prevent any further problems. Though hair transplants are a possibility, they are common at this stage of the hair loss cycle, hair transplantation can be completed on the balding areas. Typically, you can prevent any further progression of the hair loss and even regrow most of your hair with Mesotherapy medication. Don’t say it is less common. It is common on this stage. Those with Type 4 hair loss have a substantially moderate amount of hair loss. This stage can be difficult to recuperate from but must be stopped as quickly as possible. Stages beyond Type 4 are more and more difficult to come back from, as regaining all hair with treatment becomes less and less likely as the hair loss progresses. To be able to get optimal hair regrowth, immediate specialist consultation is recommended. From Mesotherapy to FUE hair transplants or PRP Treatment, there are multiple solutions to choose from in this stage. However, hair transplants are much more common and necessary from this stage forward. People with Type 5 hair loss have lost quite large amounts of hair. In this stage, it is often more difficult to regain all loss, therefore, hair transplants and PRP treatments are usually the most promising solutions with the most noticeable results. With Type 6 hair loss, an unmistakably large amount of hair has been lost; the individual is often nearly bald. 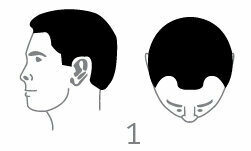 From the front of the crown to the back of the head, there are large bald or thinning areas. Though it is a more difficult stage to treat, consulting a specialist promptly can ensure maximum results. In this stage, FUE hair transplant procedures can re-generate substantial amounts of hair and put a halt to the hair loss. Type 7 hair loss usually resembles a full head of hair loss. From the front of the crown to the back, practically all hair is missing. This is the most difficult stage to come back from. Although you may feel defeated, you still have hope with FUE hair transplants or PRP treatments. There are several successful treatments for a variety of your hair loss needs. Whether you are considering a beard transplant, seeking eyebrow regrowth, desiring a full head of hair, or looking for solutions to any other hair loss needs, there are options for it all. With his use of the latest technologies and eminent experience, Dr. Serkan Aygin can optimise your results and bring back the most hair possible, even with extreme hair loss. With thousands of satisfied customers, you can be sure that he will deliver the best results for you as well. To address your hair loss condition and provide you with an accurate diagnosis, don’t hesitate to contact us.